Letter from the Department of the Secretary of State, Office of the Custodian, to Libero Sauro, July 30, 1943. The Custodian of Enemy Property (CEP) was a branch of the Canadian government that oversaw the administration of assets belonging to internees and other enemy aliens. The office served a dual function. Acting as a trustee for the internee/enemy alien, the office and its agents also protected the interests of the creditors. The CEP would pay off an internee’s debts by selling his or her property or businesses. It also collected money owed to internees by others. Each accounting firm hired by the CEP would bill an internee for administrative costs even though internees did not ask for the CEP to be involved. In this letter, the CEP is contacting Sauro regarding the collection of the $15 administration fee owing to the department. Comparable to ca. $250 today, Sauro was interned for less than four months. This is a follow-up letter to another in the collection (ICEA2010-0008-0007). Recto: [t-b, l-r]: [printed on paper] CANADA / DEPARTMENT OF THE SECRETARY OF STATE / OFFICE OF THE CUSTODIAN / ADDRESS ALL / COMMUNICATIONS / TO THE / CUSTODIAN’S OFFICE / PLEASE REFER TO / FILE NO. [dotted line] [typed] 5501 / Legal Sec. / GGB//PM / Victoria Building, 7 O’Connor Street, / Ottawa, Ontario, / July 30, 1943. 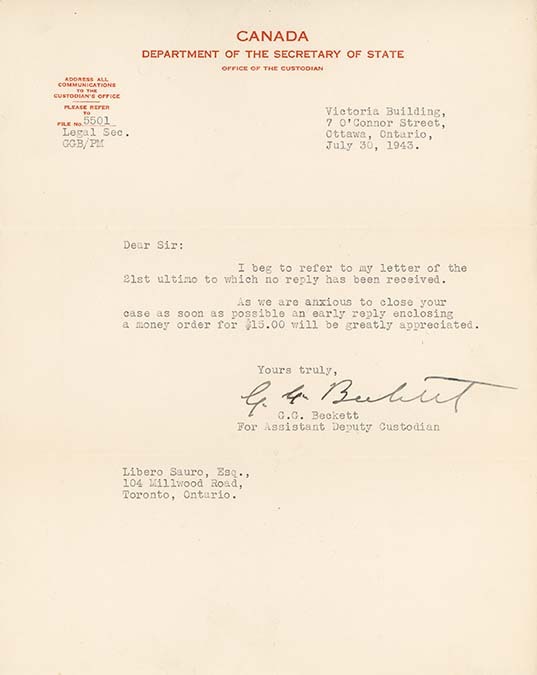 / Dear Sir: / I beg to refer to my letter of the / 21st ultimo to which no reply has been received. / As we are anxious to close your / case as soon as possible an early reply enclosing / a money order for $15.00 will be greatly appreciated. / Yours truly, [signature in ink] [typed] G.G. Beckett / For Assistant Deputy Custodian / Libero Sauro, Esq., / 104 Millwood Road, / Toronto, Ontario.